It’s that time again, and both NBC and Larry Sabato’s Crystal Ball came out with their updated 2012 electoral map this week. It’s still early on, but in a sign of just how uphill Romney’s battle is, if you start with Obama’s 2008 map, take away Florida, North Carolina, Virginia, Ohio, Indiana and the one electoral vote Obama picked up in Nebraska, Obama would still win the election. This seems like the easiest route to 270 for Obama: hold Nevada, Colorado and New Mexico in the West, New Hampshire in the East and the Al Gore 2000 Rust Belt states. Of course all of the usual caveats apply: Obama would have to maintain Iowa, which (somewhat surprisingly) NBC rates as “Lean Republican,” as well as hold New Hampshire (one of Mitt Romney’s many “home” states). Plus, it’s very early in the campaign; the states have a tendency to move in a block and changes at the national level move polls at the state level accordingly. Still, Obama looks pretty good right now. While NBC provides some of the best commentary on the electoral map, the best interactive election map I’ve found is at 270towin.com. It allows you to start with their current projections and then add or subtract states from either candidate to come up with a total. 270 to Win also has a pretty good Elctoral College App which uses data from multiple sources. 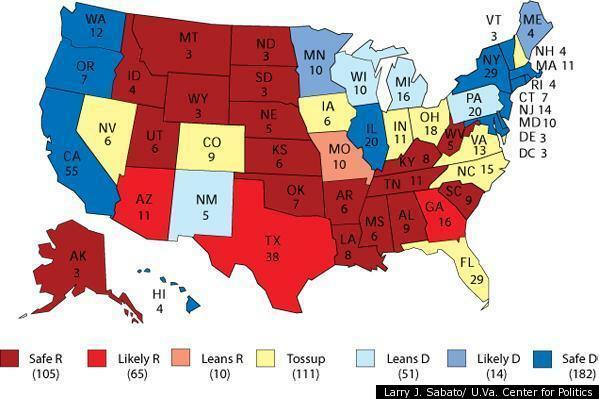 If you want a rollup of state polls, check out Real Clear Politics’ electoral map.